Smoking meats in wild cherry wood produces a mild sweet smoked taste and light mahogany finish to the meat. 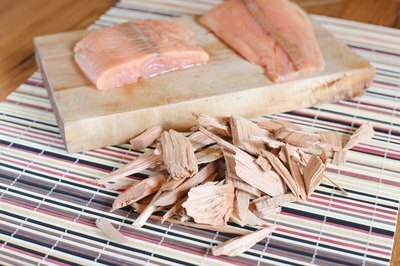 It's a universal wood that goes well with everything from salmon to venison and is an approachable choice for novice smokers. Using wild cherry wood to cook your meat at long, slow and low temperatures allows the natural juices of the meat to break down muscle fibers, resulting in sweet, tender smoked meat. When smoking, you can use four types of wild cherry wood: chips, chunks, pellets or sticks. Chips are easily found and are used a handful at a time. These are best for smoking small pieces of meat or for smoking fish, because they burn too quickly for long smoking times. 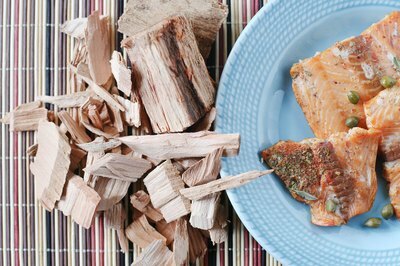 Wood chunks work well for longer smoking times, especially when mixed with charcoal to keep the barbecue heat consistent. Pellets are used in specially designed pellet cookers, and sticks (split logs) are used in large commercial smokers. When preparing your smoker, you may want to soak your wood in water before cooking; this allows it to smoke for longer periods than if it were burned while dry. Soaking chunks is optional, depending upon whether you intend to do an overnight smoke. For smoking that will only last a few hours, soaking wild cherry chunks is not necessary. 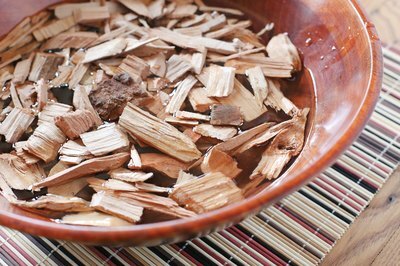 To soak your wild cherry wood for longer smoking, place it in a covered container of water and soak for 30 minutes. Take your wild cherry chips or chunks (soaked or not) and place them over the heated coals in your smoker. Let the wild cherry burn until it is producing only thin wisps of consistent smoke. For chips, this burning to smoking step can happen almost immediately, but soaked wood or chunks can take five to 10 minutes to develop a proper smoke. While you can smoke over hardwood exclusively, using charcoal helps keep the temperature and smoke levels consistent for longer periods. Never use lighter fluid to start your smoker; this will add chemicals and unwanted flavor to your meat. Be certain that the wild cherry wood you've chosen is natural and free from pesticides or chemicals. When smoking with wild cherry wood, do not use the bark of the tree. Not only can the bark carry contamination, it will also create a bitter flavor in your smoke. By using the clean, natural inside wood of wild cherry, you can keep your smoking temperature between 212 and 230 degrees Fahrenheit for spot-on results.